I love this orYANY purse! I found (or recovered - teehee) this purse for $12 at the local Goodwill Industries. I loved it for it's fun colors inside and out (inside it's a lime green, outside is a bright aqua). It's leather and has a bunch of wonderful details including a chain and clasp. It has multiple pockets inside (which I adore! ), and has 2 handles plus a shoulder-strap. It's big enough to hold all of my stuff (which I will admit, is a lot! ), but not too big (like hobo bags). I looked inside and found out that it is an "OrYANY" purse - which I admit, I have never heard of. After doing a bit of research, it appears that the brand OrYANY is a very nice brand which is carried at nicer retail shops (for example Nordstroms). Is this purse an original? I don't know.. but based on the quality of the leather and the high number of quality details, I believe it is. I just love it when I find such a great bargain!!! My daughter thinks I should post the purse on E-bay and "make some moolah". Personally, I just love having and using it! It's perfect for my needs and I get a lot of compliments whenever I use it. 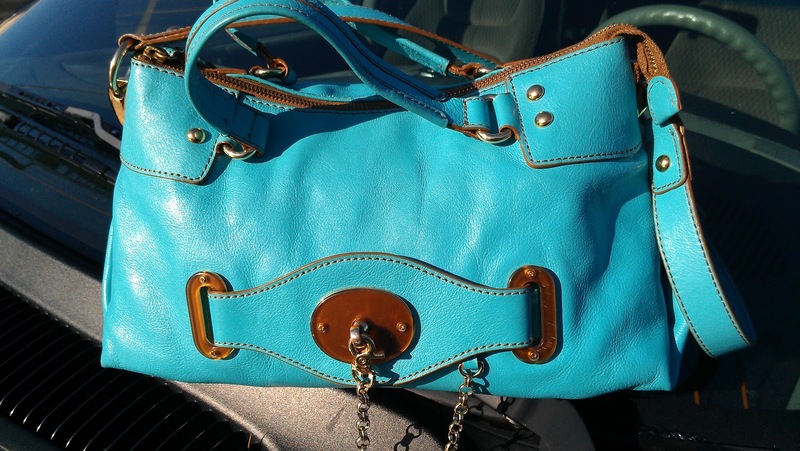 My thanks to whomever donated the purse to Goodwill!! I LOVE my new purse! Just finished making 2 new sets of "We've Moved" Postcardsn (available in sets of 8 for $8.00) and posting them at http://giftbaskets4fun.etsy.com. I love making these postcards. Not only do I get to use my rubber stamps and inks, I also get to break out the heat-gun and use my embossing powders, and my deckle scissors too! I originally started making them for a friend who's a realator and wanted to give them to her client who had just bought a house. I think they're a lot nicer than the postcards available at the Post Office!